Hanmar Site Investigation Services is an independently owned site investigation contractor specialising in all aspects of geotechnical and environmental ground investigation. It delivers services to engineering professionals and clients by providing various drilling, in-situ testing, laboratory testing, in-situ monitoring and exploratory techniques in order to produce geotechnical and environmental reports on underground conditions. As the company operates various drilling rigs and associated equipment, an investigation can normally be designed to suit the client’s requirement and obtain information in the most efficient and cost effective manner. Samples collected can be tested within the company’s own well equipped laboratories and both factual and interpretive reports in accordance with the client’s requirements can be produce. Our exploratory capabilities which are operated by our field crews include cable percussion, rotary, trial pitting, window sampling and dynamic probing. These crews are supported by our teams of engineers and geologists on site and our laboratory technicians at head office. 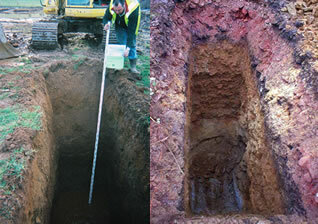 Our laboratory has soil and rock testing capabilities.